Note: In December 2012, the Kansas Rural Center transferred ownership of Our Local Food to the Kansas Department of Agriculture. Fostering relationships between food service operations and agricultural producers. By providing networking resources, communication tools and marketing materials we hope to enhance the capacity of restaurants and other food service operations to take advantage of our rich agricultural region. Growing trusting relationships between farmers and buyers is a primary focus of OLF-KRV. Providing a branding tool for locally grown products. Consumers are placing increasing importance on locally grown foods. The Our Local Food-Kaw River Valley label will unite the various sources for local foods, from grocery stores, to restaurants and farmers markets. With an eye catching label, all suppliers of local foods will benefit. Farmers can also use the label themselves to brand farm-direct products. The Kansas Rural Center was recently awarded a $70,000 grant from the Kansas Department of Agriculture to expand the Our Local Food (OLF) Program. This program seeks to spur the development of community-based food systems by creating regional networks of local farms, farmers markets, food businesses, agricultural professionals, supportive organizations and businesses, as well as consumers who are committed to increasing the production and sales of fresh, local foods in Kansas. KRC’s Our Local Food Program was launched in the Kaw River Valley region in 2010. 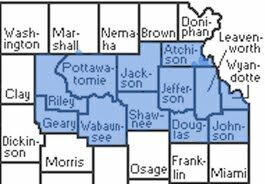 Counties comprising the Kaw River Valley Chapter include Atchison, Douglas, Geary, Jackson, Jefferson, Johnson, Leavenworth, Pottawatomie, Riley, Shawnee, Wabaunsee, and Wyandotte. The program enrolled 54 charter members in its first year– 37 farms, 7 farmers markets and 10 food businesses. With funding from the 2011 Specialty Crop Block Grant, two additional chapters are launching in 2011. The South Central Chapter (OLF-SC) encompasses Butler, Cowley, Harper, Harvey, Kingman, Reno, Sedgwick, and Sumner counties. Natalie Fullerton has been named OLF-SC Chapter Coordinator. Kansas State Research and Extension (KSRE) Sedgwick County has joined as a collaborator and will sponsor a summer intern dedicated to local food system work. The Twin Rivers Chapter (OLF-TR), under the coordination of Tracey Graham, covers Chase, Coffey, Greenwood, Lyon, Morris, and Osage counties. Building on the significant groundwork laid by the Emporia Area Local Food Network, such as the development of a community kitchen, the OLF-Twin River Chapter will expand to include broad representation from all aspects of its regional food system. The chapter model was selected over a single statewide program because it is better able to address the opportunities and challenges of individual regions while fostering important community relationships. Regional chapters are semi-autonomous but operate under OLF organizational structure which calls for each chapter to establish its own coordinator, steering and partner committees, and summer interns. Chapters will collaborate on overall Our Local Food Program efforts through the leadership of OLF Program Director Mercedes Taylor-Puckett. The Our Local Food Program label will be modified to reflect the name of each region. The label can be used by members to identify and promote food grown in that region. For example, a farmer can print out cards with the chapter label that can be used as product price cards at farmers markets on those items that have been raised in that region. Program stickers could also be placed on products like pies or jelly, if the primary ingredient was grown in the region. A restaurant could use the label for a menu item when it designates the farm from which the primary ingredient was sourced. Regional OLF label shelf tags will enable retailers to highlight products from the area. This eye-catching label will assist consumers by providing a definition of local–within that region, making it easy to select choices that support local ag producers and the their regional economy. The OLF website, launching in mid-May, will have information targeted to consumers, producers, food businesses and other groups such as economic development professionals. There will also be sections devoted to each chapter that offer a directory of farms, CSAs and farmers markets as well as food businesses that use or sell foods raised in each region. Chapter coordinators will also reach out to members and consumers through bi-weekly enewsletters to keep them up to date on events and opportunities, highlight seasonal products and profile members. With assistance from KSU’s Dr. Rhonda Janke, chapters will develop preliminary food system reports this spring. (Visit KRC’s website to download Dr. Janke’s presentation from the November sustainable ag conference that covers the preliminary work on the food report she is creating for the Douglas County Food Policy Council:http://www.kansasruralcenter.org/publications.html#CCC ) Coordinators will collect information on current agricultural production, processing and distribution capacity and gather statistics on what might be required to meet a portion of a region’s current consumption of various foods. The reports will also attempt to present a snapshot of the various channels local food currently moves through in each regional food system. The annual farm membership fee is $25. If specialty crops (defined by USDA as fruits, vegetables, tree nuts, dried fruits and horticulture and nursery crops, including floriculture) are produced, farms are eligible for complementary 2011 OLF membership through the KDA grant. Farms that only produce non-specialty crops, such as meat, dairy, and grains are not eligible for support from the grant and must submit the $25 annual membership fee. Each chapter is seeking additional program support which may reduce membership fees. Program participation also entitles members to a OLF banner or window cling and access to a tool kit with the electronic version of the OLF chapter logo, point of sale and other materials. Just what is local, anyway? You’ve probably noticed “local” popping up everywhere. But what exactly does local mean? I recently gave the Wednesday food ads a closer inspection than I normally would. Both major grocery chains in my hometown proclaimed some of their produce was locally grown. Having participated in a webinar featuring one of these major food retailers, I know that this chain considers 400 miles to be local. I’m not deriding the efforts to purchase products closer to company distribution centers. Not at all. Like so many others across the country, I’m interested in learning where my food was raised. One store’s definition of local may not be my own. I just wish stores would provide a bit more detail beyond “locally grown”. For the retailer that has worked to source food closer to its stores, perhaps a label that states Midwest grown or Missouri/Arkansas/Iowa raised might prove to be a bit more informative. he beauty of the Our Local Food-Kaw River Valley program is that the term local is clearly defined. To be eligible to use the OLF label, a product must have been raised in one of twelve counties in Northeast Kansas-Atchison, Douglas, Geary, Jackson, Jefferson, Johnson, Leavenworth, Pottawatomie, Riley, Shawnee, Wabaunsee, or Wyandotte. Did you notice that raised was italicized? This is another criteria that sets the Our Local Food label apart from other local branding programs. When you buy a strawberry jam bearing the OLF label, you can be assured that the berries in the jam were actually grown in the Kaw River Valley. While we applaud and encourage local entrepreneurs who are crafting their own artisan food products, unless the primary ingredient is raised in our region, a food can’t display the Our Local Food label. We think this is the key to building a strong local food system. With the Our Local Food-Kaw River Valley label, you can trace your food from the farm to your fork.